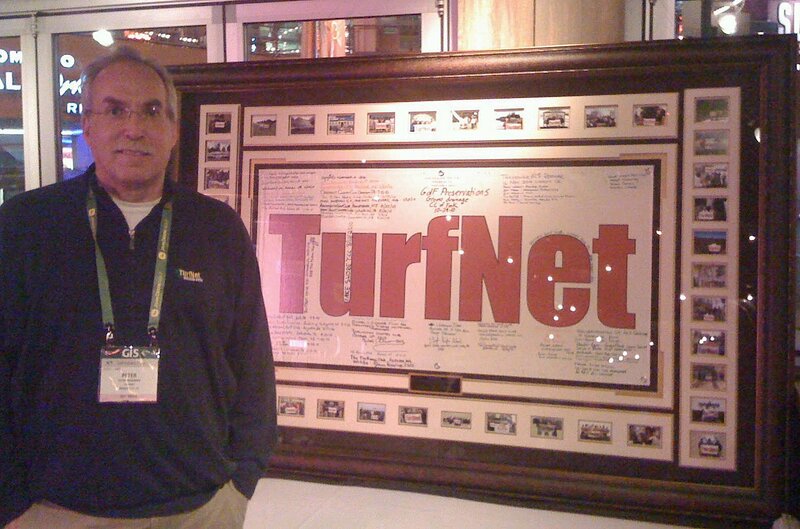 TurfNet founder Peter McCormick with the 'Where's TurfNet?' banner at the 2011 GIS in Orlando. Armed with little more than a freshly inked monthly print newsletter, a $20 bill in his pocket, and a blank slate for ideas to come, Peter McCormick filed the incorporation papers for TurfNet on February 1, 1994. His initial goal was to not be one of the 90% of new businesses that fail within the first five years. With the support, participation and intellectual investment of forward-thinking superintendents and commercial members, TurfNet made it. In spades. In his editorial column in the inaugural issue of TurfNet Monthly, McCormick wrote, "... 'a good business enhances the lives of all who work within it and enriches the lives of all who are touched by it'. ... I will grow a good business. I will add quality people over time who will fuel that growth. and we will all have fun doing it." A pretty accurate forecast. For perspective, 1994 also saw the release of Forrest Gump, Shawhank Redemption and The Lion King. The Sony PlayStation was launched. Justin Bieber was born. Yahoo and Amazon were founded. Kicking off in the NJ/NY metro area where McCormick had previously been the sales manager for a Toro distributor, TurfNet steadily carved a niche among early-adopting superintendents who saw its potential. McCormick was assisted in the early years by his brother Bob, with a satellite office in Charlotte, NC. "When I think of Peter, it immediately puts a smile on my face," said Matt Shaffer, a pioneering superintendent in his own right before retiring two years ago. "Here is a man that never once walked at the back of the pack. Had he been born in the late 1700s, there is no doubt in my mind that he would have left before Lewis and Clark to explore the Wild West." Longtime TurfNet member Rick Tegtmeier, CGCS MG at Des Moines Golf and Country Club, recalled visiting an early online message board when he first learned about the possible advent of TurfNet. I will grow a good business. I will add quality people over time who will fuel that growth. and we will all have fun doing it." "I remember being on Turfbyte and Peter calling me to tell me about his idea of TurfNet," Tegtmeier said. "I thought at the time it was a futile endeavor and why would one pay to join this group when we had GCSAA. Well, time has proven me wrong, and I am so happy I jumped on the TurfNet train at that time." Much has changed since McCormick’s first trade show, the 1996 NYSTA conference that involved a $6,000 investment in a new booth backdrop, no member signups and a long, soul-searching drive home to New Jersey. It hasn't always been a bowl of cherries. McCormick's enthusiasm for his first trade show was tempered by zero business done. TurfNet soon brought the industry's first job board that through the years has helped thousands find employment, and a marketplace for used equipment that has allowed buyers and sellers alike to save money that can be used elsewhere. The members-only forum provides a venue where superintendents, assistants and equipment technicians can give or receive solutions to nagging agronomic, equipment, irrigation or labor-related issues, or discuss current events, politics, movies and more. Those keystones continue to serve as TurfNet's foundation today. "TurfNet is more than a page that loads on my browser at startup," said Jim Campion of NCR Country Club in Kettering, Ohio. "It is a consolidated, easy-to-use tool for me to utilize when looking to network, sell or buy equipment, hire staff or stay current with hot topics in the forum." Although there are many media where one can get advice on agronomic and other issues important to superintendents, the sense of community and camaraderie of the TurfNet Forum make it a trusted source for many, says Tegtmeier. "I have learned so many innovative ideas from the TurfNet family," Tegtmeier said. "Many times, we think we need to try something, but were afraid of the consequences. However, being on TurfNet one just had to post the idea and pretty soon you would have some answers from others that had tried it, or they encourage you and your ideas. I have met so many friends and colleagues on TurfNet, it has broadened my networking opportunities over the years. I can't imagine doing my job without the support from the TurfNet family. If I had one recommendation today for a young turf professional, it would be to join TurfNet and become an active participant. Sure, there are other forms of networking through social media, but the TurfNet family is so much more than 140 characters." Superintendent of the Year Rick Tegtmeier (l) with Peter McCormick at GIS 2018. Shaffer agreed, saying the Forum has been unique because it is a place to get frank advice and unbiased critiques of products and equipment. "There is no doubt about it, when God put Peter McCormick on this earth, he intended for him to be a disrupter, and he couldn't have found a more qualified candidate," Shaffer said. "He stirred the pot with his online forums. Peter took issues that everyone was whispering about, exposed them and they were resolved years ahead of schedule." 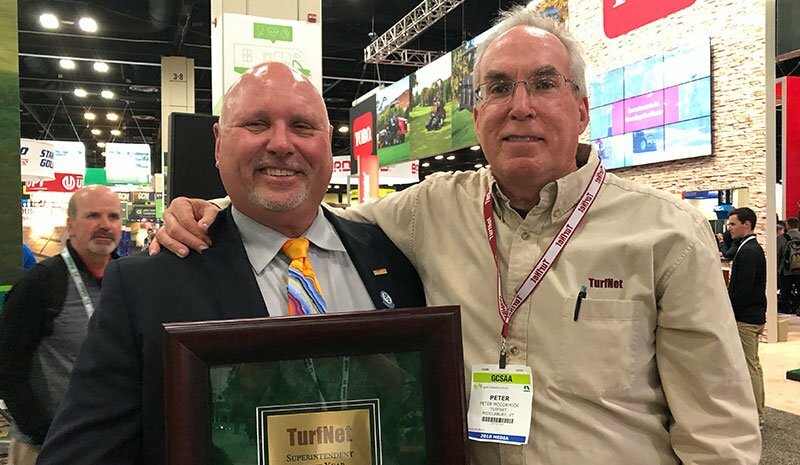 Like any good business, TurfNet has grown and evolved since 1994, but the emphasis always has been on creating and maintaining a place where superintendents could feel like they were part of a community, where they could network with peers with common interests and issues, trade stories and advice and have a laugh along the way. To that end, the inaugural "Beer and Pretzels Gala" was launched at the 1997 GCSAA annual conference and show (now the Golf Industry Show) in Anaheim, California, and two years later, Team TurfNet participated for the first time in the annual Golf Course Hockey Challenge tournament in Ontario. Both continue to this day. ...the emphasis always has been on creating and maintaining a place where superintendents could feel like they were part of a community, where they could network with peers with common interests and issues, trade stories and advice and have a laugh along the way. "I have made so many great friends from all over the country, shared lots of laughs and the stories from years past. You can't make this stuff up," said Ken Lallier, CGCS at the Quechee Club, in Quechee, Vermont and sole participant as goaltender in all 21 seasons with the TurfNet hockey team. "Thanks to Coach (McCormick) for using TurfNet to bring a bunch of hockey-loving turfheads together each year in Niagara Falls. It has been priceless. Another unexpected benefit from the TurfNet brotherhood." 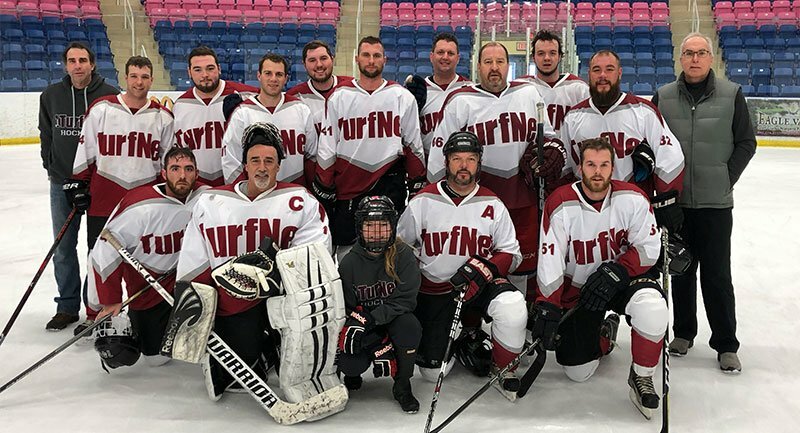 21-year goaltender and team captain Ken Lallier with Team TurfNet 2019 earlier this week at the 25th Annual Golf Course Hockey Challenge in Niagara Falls. Coach/sponsor Peter McCormick is at right. McCormick sold TurfNet in 2001 to Turnstile Publishing Co., an Orlando, Florida-based company owned by Rance Crain of Crain Communications fame. Turnstile published Golfweek and Golfweek's SuperintendentNEWS magazines and wanted to add a turf-oriented web presence. McCormick stayed on to manage the TurfNet business segment and orchestrate it's future growth. 18 years later, he's still there. In late 2007, Turnstile ceased publication of SuperNEWS (which had become TurfNet the Magazine for several issues). John Reitman and Jon Kiger, the magazine's editor and advertising director, joined TurfNet in similar capacities. Also joining TurfNet at that time was Eleanor Geddes. As TurfNet's "director of member happiness" she continues to be the administrative glue that holds everything together and keeps everyone moving forward on a day-to-day basis. Making the migration with SuperNEWS were the publication's annual Superintendent of the Year and Technician of the Year awards that recognize industry leaders for their hard work, dedication and ingenuity. The Superintendent's Best Friend dog calendar also assumed TurfNet branding. Added to the TurfNet offerings over the ensuing years were TurfNet University (2008), TurfNetTV (2009) and TurfNetRADIO (2014), as well as blogs by Paul MacCormack, Joe Fearn, Matt Leverich, and Jim McLoughlin. 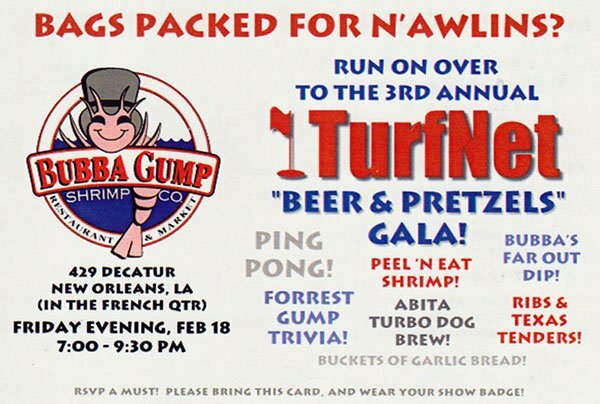 The Beer & Pretzel Gala in New Orleans, 2000, was the party 300 attendees were still talking about ten years later. The TurfNet University Webinar series brought more than 20 online educational seminars to thousands of viewers annually. TurfNetTV introduced the irreverent Randy Wilson and his fictional Rockbottum Country Club, Hector Velazquez and Hector's Shop, OnCourse with Kevin Ross, and hundreds of Tips & Tricks videos. TurfNetRADIO podcasts include the popular Frankly Speaking series with Cornell University professor Frank Rossi, the Turfgrass Zealot Project with Dave Wilber, profiles of career superintendents in Living Legends, career guidance in The Ladder, and a roundup of renovation and restoration projects with Anthony Pioppi in The Renovation Report. "Being one of the first 50-members of TurfNet I can honestly say it's been a big part of my career as a turfgrass professional," said Tony Girardi, CGCS MG at Rockrimmon Country Club in Stamford, Connecticut. "The forum has been invaluable through the years and I have learned many tips and tricks, as well as making many friends along the way. 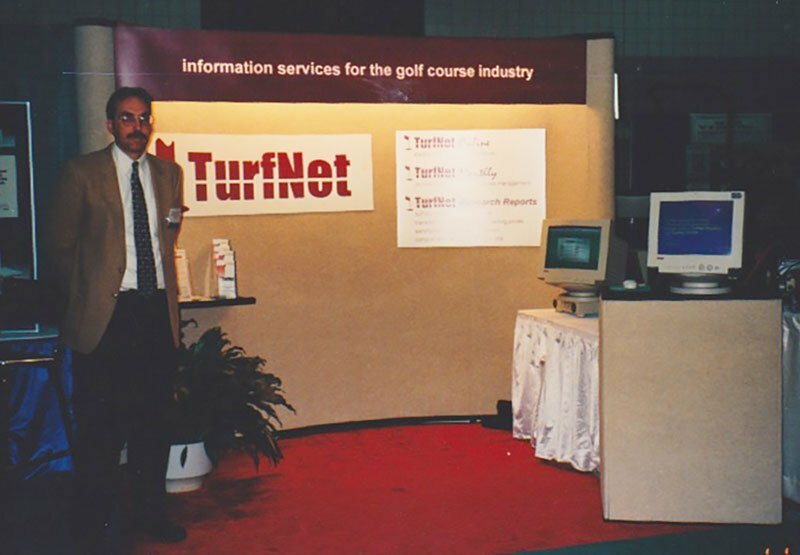 I don't know where we would all be in the turf industry without TurfNet by our side for the past 25 years. Kudos to Peter and everyone at TurfNet who have made this a wonderful journey." I don't know where we would all be in the turf industry without TurfNet by our side for the past 25 years..."
Former superintendent and general manager at Huntsville Golf Club in Shavertown, Pennsylvania and the founder and owner of Elite Sports Turf Management, Scott Schukraft was one of those early adopters of technology looking for an edge in his career. "I didn't know Peter McCormick when he started TurfNet, but I immediately saw how important and impactful a tool it was," Schukraft said. "I signed on 25 years ago, and have never looked back. I can still remember anxiously awaiting the monthly print newsletter, if for no other reason, to read his always-insightful View from the Cheap Seats. TurfNet has become my go-to trusted industry resource for just about everything. Throughout the years and many changes, it has evolved and remained relevant unlike any other that comes to mind. Looking forward to the next 25 years." Other additions to the TurfNet inventory of benefits include an annual members golf trip that has visited Ireland on several occasions, Scotland, Bandon Dunes and the Kohler properties in Wisconsin, a members trip to the British and International Golf Greenkeepers Association turf exposition in the United Kingdom and an overseas internship for a U.S.-based turf management student. TurfNet has become my go-to trusted industry resource for just about everything. Throughout the years and many changes, it has evolved and remained relevant unlike any other that comes to mind." John Paquette of Indian Hill Country Club in Northport, New York is a charter member of TurfNet from that first year in 1994. Last year, his family was one of the recipients of the inaugural Coldiron Positivity Awards, named in honor of longtime TurfNet friend Jerry Coldiron, a former superintendent who was working for Hector Turf in South Florida when he died suddenly on Nov. 22, 2017. Paquette's family was singled out for one of the $2,500 awards disbursed by the Jerry Coldiron Embrace Life! Fund after son Nick Paquette was diagnosed with leukemia. With the support of his family, Nick completed treatments last year and is back in action at SUNY New Paltz, where he is a senior on the basketball team. The elder Paquette is grateful for the sense of community TurfNet has brought not only to him, but his family. "I've been able to hire great people; make great friends; buy and sell equipment; blow off steam; learn, learn and learn more about turf and tips on how to do it better," Paquette said. "I traveled with my dad and a fantastic group of gentlemen, led by Jon Kiger, to Ireland in '11 for which we both often recall as one of the best weeks of our lives. And, most importantly, my son, Nick, and I have and continue to receive tremendous, uplifting support from our membership with respect to his unending battle with Leukemia for which we are forever grateful. Peter, I thank you for this gift you have given us all." 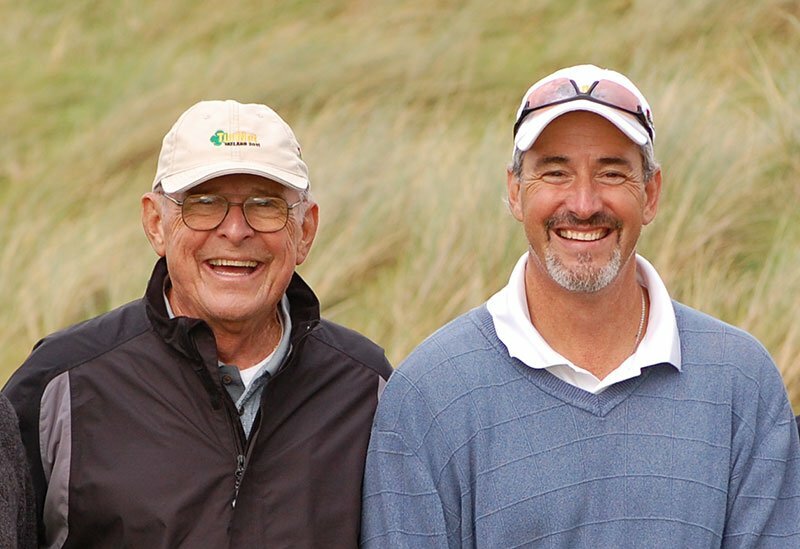 John Paquette (r) with his father, Bill, at Ballybunion on the TurfNet Members Trip, 2011. No one has a crystal ball, but one thing is certain: TurfNet will continue to lead, innovate and bring new ideas and solutions to the turf industry. "I always wonder 'what is Peter thinking about now?' " Shaffer said. "I am sure it is something none of the rest of us have thought about yet."